Is this the second best Thai restaurant in town? Well if you judge such things by the todd munn (deep-fried fish cakes), the sour sausage, grilled beef salad, Laotian-style green papaya salad (som tam), and something called “stir-fried, hot spicy hog,” we’d say yes. We’re also partial to their version of pla gkoong (raw shrimp salad), dressed as it is with heaps of cilantro and lemongrass. We hate to admit it, but we prefer it to Saipin Chutima’s version at Lotus of Siam. The place seems to be run by a bunch of Thai gals who don’t seem to do a lot of business, but do seem to put a lot of love into their “family-style” (their words) Thai cooking. Located in the shadow of the Stratosphere, this place has been around for a few years now, and took over a Chinese restaurant that occupied the spot for decades. That Chinese spot was the first meal in Vegas ELV ate — with Food Gal #1 — when he moved here in January, 1981. Other than that one meal — after a three day journey in a rented truck with no radio, three cats, and the inability to go over 55 mph — we hadn’t been back. Since it’s been Ocha Thai, we find ourselves going all the time. 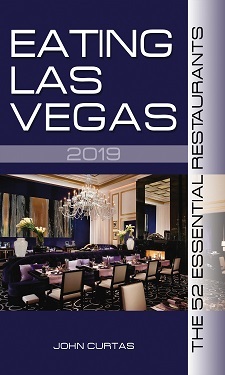 Perhaps Ocha is what downtown denizen and realtor Jack LeVine was talking about last week when he referred to all the quaint “….mom and pops…” populating this area of Las Vegas Boulevard (during the uproar over Luv-it-Custard’s bad location). But from a window seat at this tasty Thai, all you will see is tattoo parlors and a string of no-tell-motels. So just pay attention to the food. Dinner for two will run you well under $50, for a mountain of tasty Thai delights. Perhaps he meant any of these nearby restaurants. They run the gamut from decent to exceptional, but I’m happy to have them all within walking distance of my house.